All patient embarking upon orthodontic treatment should be aware of the possible adverse effects of treatment. Several of these effects are outlined below. It must be stressed that the vast majority of orthodontic treatment undertaken is NOT associated with significant adverse effects. The mouth is populated by millions of bacteria that adhere onto both the tooth and mucosal surfaces. Some of these bacteria which populate the teeth produce acids from sugars that are ingested in the diet. If the frequency of sugar intake is excessive then too much acid is produced which results in tooth decay (also termed caries or decalcification). Keep you teeth clean. The teeth should be cleaned at least twice a day. It is also helpful to carry a toothbrush to work or school so that the teeth can be quickly cleaned following meals. Disclosing tablets are a useful aid to showing areas that have been missed during tooth brushing. Use a fluoridated toothpaste. Pick a toothpaste that contains at least 1450 ppm of Fluoride. Young children should use a childrenâ€™s toothpaste that contains less fluoride. Fluoride helps to strengthen tooth enamel. Use a daily mouthwash containing Fluoride. Not all mouthwashes contain Fluoride so it is important to check the label carefully. Young children should avoid mouthwashes. Your orthodontist can predict, with considerable success, patients more likely to exhibit significant resorption by studying the pre–treatment radiographs (x–rays). This can help to warn patients who may be particularly prone to this complication. 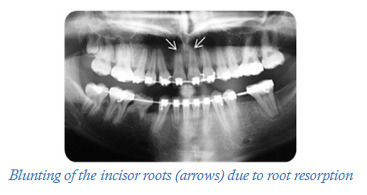 Radiographs can also be taken during treatment to monitor if the roots are becoming shorter. Certain habits such as nail biting, pen chewing and digit sucking can increase the chances of root resorption by placing additional compressive loads onto the teeth. There is large individual variation in the intensity of pain experienced by patients during fixed appliance therapy. Most will experience some pain that is caused by a localised inflammatory reaction around the tooth socket. The pain is usually dull in character and is made worse by placing pressure onto the teeth. It usually starts within a few hours after appliance placement or adjustment, increases over the next 24 hours, and decreases to baseline levels within 5–7 days. It may show variation within the day with greatest intensity in the evening and night. Mild pain killers, such as Paracetamol or Ibuprofen, can be used to control the discomfort. 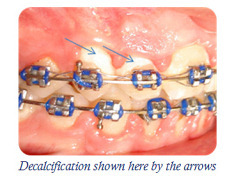 It is common for the gums to swell slightly during orthodontic treatment because of plaque accumulation. This swelling will often resolve 1–2 weeks after appliance removal. There is a risk that patients with pre-existing recession are at risk of further recession during orthodontic tooth movement. This risk can be minimised by ensuring that the teeth are kept clean, a non-traumatic brushing technique is used and that regular visits to the hygienist are scheduled during treatment. 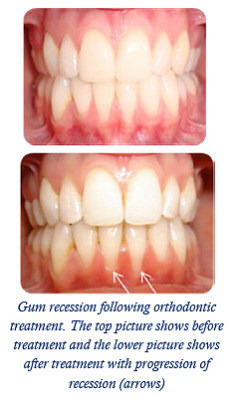 Your orthodontist will also closely monitor the recession during treatment to ensure that it is not progressing. Gum recession following orthodontic treatment. There is no evidence that orthodontic treatment can create problems with the jaw joints or make pre-existing jaw joint problems worse. Equally there is no scientific evidence that orthodontic treatment can treat jaw joint problems in the majority of individuals.